We had walked about twenty steps up Royal Street, just past Marigny Brasserie, when the elephant tear raindrops started to fall in big splats on the sidewalk. We futilely tried to open umbrellas, but it was no use — as if someone pulled the drain plug from the bottom of a cloud — and the sky started sheeting on us. Our proximity to each other only made it worse, as the rainwater sluiced off the other’s umbrella, drenching and unusually cold for a New Orleans summer: we needed cover. As we tried to duck out of the deluge, a familiar figure ran past and told us to come back to Frenchman at 8PM — something was going down for Uncle Lionel. We parted ways at the corner where Royal turns back towards the Quarter, seeking shelter in the R Bar as our friend disappeared into one of the neat shotguns that line Royal. “Uncle” Lionel Batiste passed on yesterday. It was the first news I received, bracing and without coffee; I had never met him. I had seen him though, the dapper and preternaturally cool figure on Frenchman; the thin and always smiling bass drummer of the Treme Brass Band who seemingly never broke a sweat in his pin neat white uniform. To say Uncle Lionel had style would be an understatement. Uncle Lionel was style. When he was on the street, people took notice. When he spoke, generations of younger New Orleans musicians learned about cool. But Uncle Lionel was also substance. Ask Kermit Ruffins or Glen David Andrews or Wendell Pierce or any number of others who gave immediate and moving testimony to the man almost instantly upon hearing the news. Ask the merchants and patrons of Frenchmen who spoke movingly to the TV crews of a man that won’t ever be replaced. When Uncle Lionel’s image dominated Times Square (we were living in NJ and working in NYC at the time) it sent chills down your spine. If ever there was an image of resilience this tough as beef jerky image of an immaculate man beating a drum — not his drum, but the drum of an entire city — was it. Boom boom boom! We are still here. Boom boom boom! We are rising! Boom boom boom! I’ll fly away, but not yet… there’s work to be done. dba was dark as a cave as the Palmetto Bug Stompers played the old Christian spiritual “I’ll Fly Away.” It was fitting. There was a nervous energy on the street, as a small pool of men spoke in front of the Spotted Cat Music Club, and news crews wandered up and down the street interviewing merchants and patrons who wanted to pay tribute to Uncle Lionel. Officially, no one had heard anything about a second line, but I trusted my source. Still, as 8PM came and went, even I was beginning to doubt. Sometimes things just don’t come together. I knew that Kermit was paying tribute down at his Treme Speakeasy, and I thought that maybe the party had moved down there. And then I heard the high, plaintive wail of a trumpet somewhere outside, and I saw a group of NOPD gather on the corner. It was around 9PM, but something was going down, if for no other reason than the presence of cops. A chill went down my spine. As if he were a general rallying retreating troops, the loose group of musicians, college kids, old folks, white and black, coalesced into an organized mob. I still don’t know who our leader was, but by the short speech he delivered, I can only assume he was a nephew of Uncle Lionel — whether by blood or spirit I don’t know. And then, ever so slowly, he reprised “I’ll Fly Away,” leading us against traffic down Frenchman, the cabs and cars first trying to skirt past us, and then pulling off to the sides of the road. When we got down as far as Cafe Negrill, we stopped, and what was more like a candlelight vigil became a celebration. Two sousaphone players appeared out of air. Then two trombones, held up high slid into dipthonged notes. A kid holding a snare rushed up and clumsily clipped it in place and was scolded by the others for being late. Then a bass drum, a tightly tuned cymbal atop it, played with a phillips head screwdriver, picked up the tempo. And all of a sudden Frenchmen Street exploded into a Treme second line as a calvary of musicians filled out the parts. Our retreat now a charge, we pushed up Frenchmen like a wave, tributaries of people streaming out of the bars — musicians too — to join the celebration. It was as if a water main burst, and the Second line flowed all over Frenchmen, into the Spotted Cat, and then back up to the corner where Uncle Lionel lived. The cops stood back and watched, and traffic still tried to pass us, but it was futile. The spirit of Uncle Lionel commanded the night. As quickly as it came together, it also dispersed, like a summer storm. I laughed inside when I heard a college age girl with an east coast accent tell her friend uncomfortably “This is getting unorganized.” She had obviously missed the spontaneous joy of what had just occurred. I know that at some point this week Uncle Lionel will have proper services, a true jazz funeral, and a second line tribute of thousands, including most of New Orleans’ political and musical luminaries: and he should, he deserves that honor. 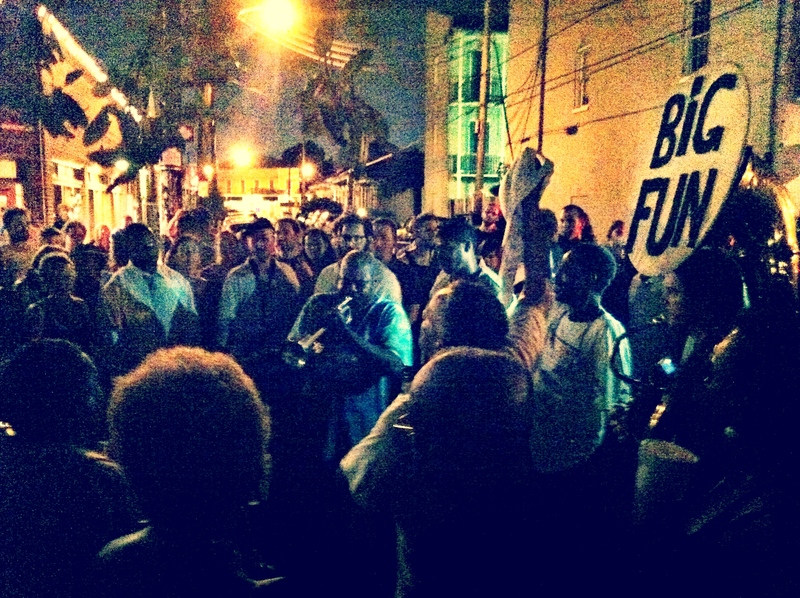 However, last night on Frenchmen, a street he loved so much, we sent up a prayer that was sure to reach him and his indelible smile, the strains of a brass band and a city united in love for a man who carried New Orleans on his back like a big bass drum. What a beautiful tribute to a man we all love so much. Thank you for sharing your experience for those of us who aren’t there. Thanks for sharing. i was on Frenchmen Saturday night, at Maison, and witnessed a similar, seeminlgly beautifully random, congregation of musician’s. Though it was not in honor of Lionel, it was purely New Orleans. A wonderful little funk band called Master Blasters was playing a tips only gig there. Then towards the end of their set, different musician’s began coming in off the street and just started playing, in the middle of the song! Two amazing trumpeters just took their horns out of their cases and BLEW the place up! Then a couple of saxophonists joined in, in addition to the one, Joe, who was in the original line up! It was a wall of pure New Orleans funk that had to be experienced to be beleived! Frenchmen streeters started streaming in the doors and spontaneous dancing with strangers ensued, it was New Orleans in her truest form! RIP Lionel, we shall carry on! That, m’dear, was brilliant. I’m a writer myself who had to go the other way, from the coast and NO to the Northwest, and you did the place, and Uncle Lionel, proud. Thanks for making me, in true New Orleans fashion, laugh and cry at the same time. Beautiful tribute. Been thinking of Uncle Lionel all day and thanks for making me feel like I was there last night at the Spotted Cat where I first spotted the one and only Uncle Lionel! So beautiful. Thank you for taking me there.